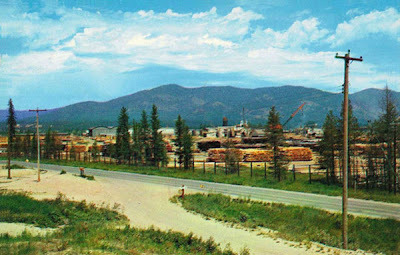 This is an old postcard view from about 1960 or so, with the caption, "the largest pine lumber mill in the world." The photo shows a part of the old J. Neils Lumber Company complex just outside of Libby, by then owned by St. Regis Paper. Neils Lumber was the economic lifeblood of Libby for decades, harvesting timber with a sustainable-use philosophy that both kept the company strong and sustained local forests. After the company was sold, though, absentee owners increased production to the point where the forests could no longer keep up ... and before long the whole thing collapsed. The mill closed in 2002, devastating the local economy, and a spectacular fire last year destroyed much of what was left of the place.